This soft and sheer cut away stabilizer from Quilter's Select is ultra lightweight and can be temporarily fused to the back of fabrics for applique, t-shirt quilts, and more. This non-stretchy stabilizer adds stability to stretchy fabrics making them easier to sew. Sold by the yard. 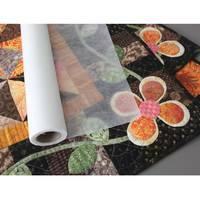 The Quilter's Select Cut-Away Stabilizer measures 20 inches wide.